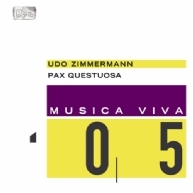 Udo Zimmermann composed Pax Questuosa for the centenary celebration of the Berlin Philharmonics in 1982. His attempt to translate the deplorable state of world peace into words, sounds and musical form may or may not be understood as an accusation: “Art does not deliver reports. It neither formulates principles, nor does it issue slogans. All I want to do is to express, in my own way and to the extent of my abilities, the need for peace within us,” said Udo Zimmermann. The core of the piece is the prayer for peace by Saint Franciscus. “I consider it a human-holy legacy from our peaceless and unholy past – both legacy and invocation.” This core is surrounded by poems of the last century, written by Nelly Sachs, Wolfgang Borchert, Heinrich Böll and others, to whose “emotional force” the composer has a certain affinity. The maxim of the piece could very well be: “When it comes to peace, it is the personal responsibility of the individual to get down to business.” Thanks to an emotionally dense performance and excellent vocal soloists, the present recording conveys this message most insistently.